Learn how to cook those beautiful thick cut pork chops. Just follow these easy step by step photo instructions. Add in some gravy and you’re in pork heaven again. Editor’s Note: Originally published July 17, 2016. Now updated with improved text and instructions along with updated photos. I love pork and gravy. And nice thick pork chop smothered in gravy is the ultimate comfort food for many. Today’s pork is not yesterday’s pork. It is now a lean meat and can be part of a healthy balanced diet. But cooking 1 1/2 to 2 inches thick pork chops needs some special tricks. Let’s talk about some options. It’s a little hard to give this a four instead of a five, but they are just too big for me. 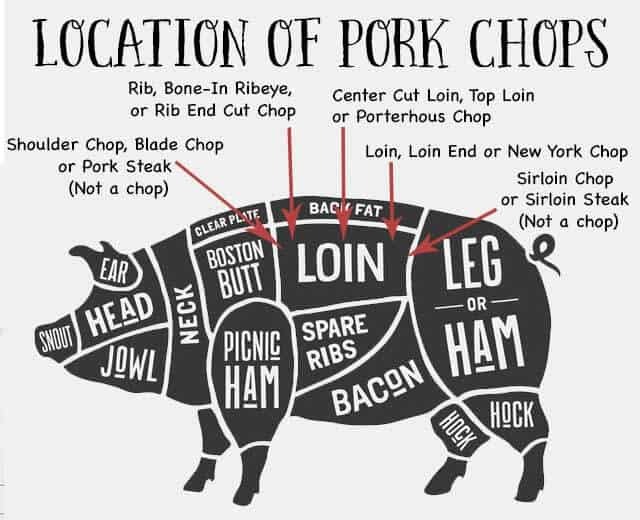 The pork chops we are talking about in this recipe will be one of the middle three in the above diagram. Usually the “thick pork chops” will be a boneless slice of a whole pork loin. If you enjoy these thicker pork chops, then pick up a whole pork loin when they are on sale and cut it yourself. Half the price and they will freeze great for 3-4 months. I didn’t brine in this recipe, but I would recommend it if you have the time. Combine 2 tablespoons of salt, 2 tablespoons of sugar (brown or white) with 2 cups of water. Add the chops and refrigerate for 30 minutes to a few hours. After brining, rinse well to remove extra salt. If you brine, you have already salted the chops. Do not use the seasoning salt. Just some pepper and a sprinkle of paprika would be good. This is the real secret to getting thick pork chops done right. An old trick but a goodie. This is not ground meat, so it is safe to rest at room temperature for an hour or so. It will cook faster, be moister and overall a good thing. If you have the time to do this start looking at the temperature of the meat after about 10 minutes in the oven since it will be done faster. Remember you are cooking to a final temperature and not by time. I so love gravy aka “The nectar of the gods”. I like to use a pork gravy base from Penzeys to make “pork broth”. If you don’t have the gravy base, you can use chicken or vegetable broth. 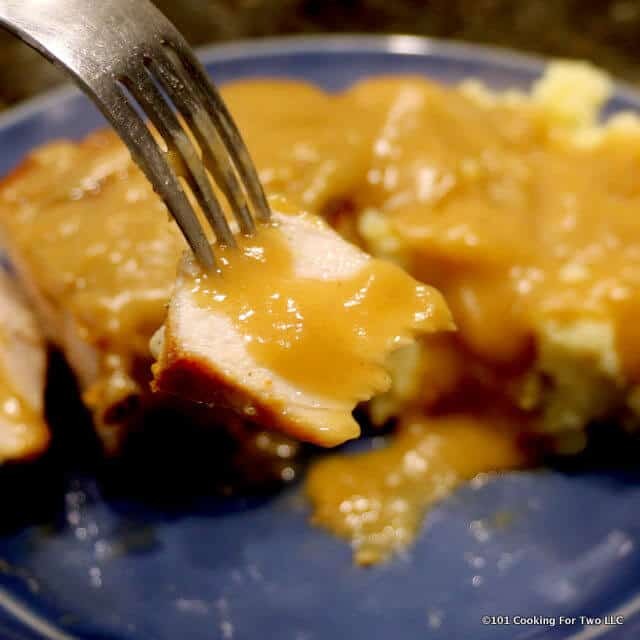 There are two basic ways to make gravy. 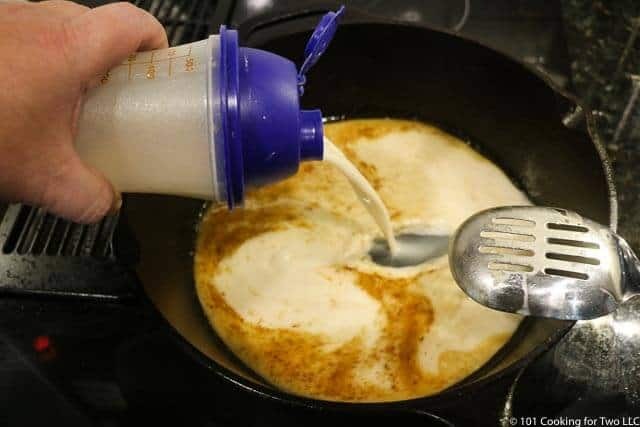 You can make a roux by mixing flour with the grease in the pan and cooking for a few minutes. Or our simple way of mixing flour in some liquid and adding that to boiling fluid. For more information on gravy, please visit How To Make Gravy at Home. Allow the pork chops to rest at room temperature for 30-60 minutes. Preheat oven to 375 convection or 400 conventional. These center cut chops are 1 1/2 inches thick and weigh 12 oz each. If there is a fat ring, trim it to 1/2 inch thick and slice it at about 1-inch intervals. Season to taste with a seasoning salt and pepper. Heat 2 tablespoons oil over medium-high heat. 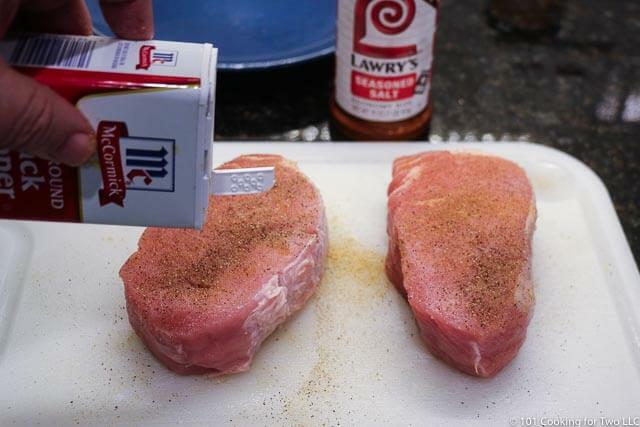 When shimmering add the seasoned pork chops. Sear both sides of the chops for 2-3 minutes until gettings some nice browning. Transfer to the preheated oven and cook until internal temperature of 145-150. About 25 minutes for me. Total cooking time will be variable due to the thickness of pork and start temperature of the chops. Remove from pan and tent lightly with foil while doing gravy phase. Using gravy base, mix 2 cups of pork broth. You can also use chicken or vegetable broth. Whisk 4 tablespoons flour into one cup of broth. Add the other one cup of your broth to the pan over medium heat. When boiling, slowly add the broth/flour mixture while continuously whisking. Continue to whisk until thickened about 2-3 minutes. 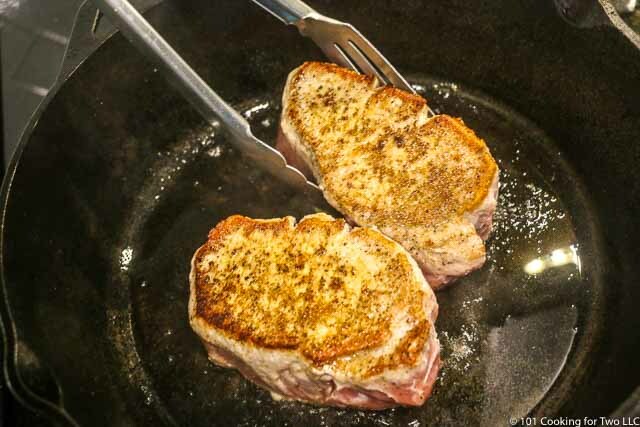 Learn how to cook those beautiful thick cut pork chops. Just follow these easy step by step photo instructions. Add in some gravy and you're in pork heaven. Allow pork chops to rest at room temperature for 30-60 minutes. Preheat oven to 375 convection or 400 conventional. Heat 2 tablespoons oil over medium-high heat. When shimmering add the seasoned pork chops. Sear both sides of the chops for 2-3 minutes until gettings some nice browning. Transfer to the preheated oven and cook until internal temperature of 145-150. About 25 minutes for me. Total cooking time will be variable due to the thickness of pork and start temperature of the chops. Remove from pan and tent lightly with foil while doing gravy phase. Using gravy base, mix 2 cups of pork broth. You can also use chicken or vegetable broth. Whisk 4 tablespoons flour into one cup of broth. Add the other one cup of your broth to the pan over medium heat. When boiling, slowly add the broth/flour mixture while continuously whisking. Use an oven-safe pan like cast iron. Brine if you have time. A suggested brine is 2 cups of water with 2 tablespoons salt and 2 tablespoons brown sugar for 30 minutes to 2 hours. Be sure to refrigerate. If you brine, do not use any seasoning with salt. 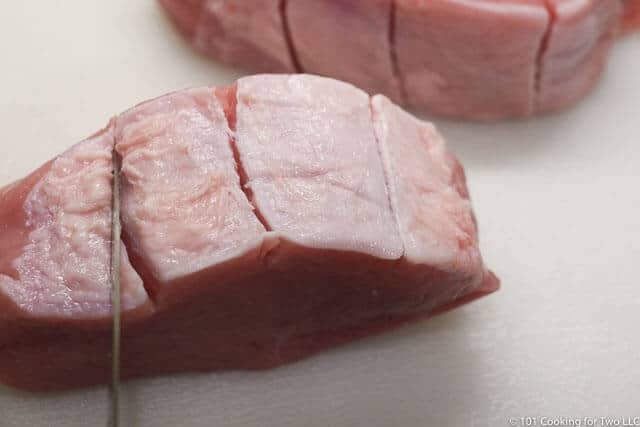 With thick pork chops, the most import tip is to rest to room temperature before starting to cook. Sear to the final color you want. Never cook by time. Cook to the final temperature you want. Remember it will increase a few degrees after removed from the oven. I’ve had two [2″] chops staring at me when I open the freezer for a few months; scared to cook them. I tried this and followed to the letter complete with the brine. I’m a huge cast iron skillet person and these things came out a #10. They were juicy, tender, beautifully browned and hands down, the best chops I have EVER had! I used a leave-in digital thermometer and took them out at 150 F. I served them after basting with some of the drippings. I couldn’t believe they reached 150 F. after only 20 minutes. Perfection. Thank-you for this recipe. Pork is relatively cheap in spring so I’ll be cooking this many, many times. I do love a good chop. This recipe is just a logical method of cooking. Glad it worked well for you. So I have found your blog and I am planning on using the recipe for my thick cut chops tonight. What I really want to know is, how tender will this make the chops. I have a family member who is dentally challenged and would like them to be able to eat them. Any ideas on how to cook tender without drying them out? Pork loin cuts like pork chops vary. We had a wonderfully tender 1 inch pork chop last night I cooked on the stovetop only. I cut it with a fork. BUT that is the exception. You need to have an almost guaranteed result for your situation. I have two things for you and one other suggestion. A brine is used to add moisture to meat like pork loin. 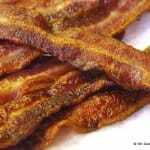 A standard pork brine is 1 cup of water with 1 tablespoon of salt. The salt is standard table salt. If using a different salt, you should adjust accordingly. For 1-4 hours. Rinse before cooking and do NOT add any more salt. Second, watch the internal temperature closely. 145 (a little pink) to 155 (no pink) but not higher. You may be right that the brine did a lot for you. Pork chops are from the loin and it is very lean anymore, so a brine if you have time, is always a good thing. But the pan sear to oven technique tends to keep them moister if you’re careful not to overcook. I usually dry out my chops. So I tried this recipe. What a hit! I had company show up when making them so my boyfriend and I shared with them. They were out of this world. The gracy was scrumptious and the chops juicy and delicious. I am now making them again. So good. Can’t wait until they are done. Yum! I love pork chops with gravy. Glad it worked well for you. 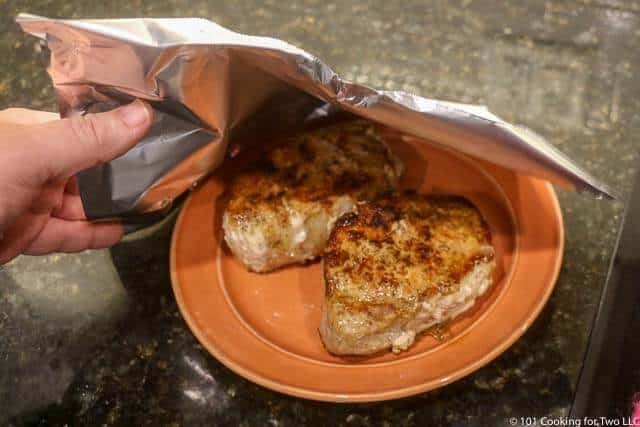 Do you cover the pan when placed in the oven? Made this tonight, we all loved it, it was so so so so good!! Definitely adding to my recipe box! Thank you! I do love pork chops. I just did the stovetop version tonight with gravy. Tried these tonight and they were delicious. Only had a 1/2 hr to brine but could tell the difference. Thanks! Hey! Trying these tonight but of note, your recipe instructions seem to duplicate the gravy instructions with some variances?? Maybe I’m just not processing it right but I’ve read it through several times and still I’m confused! Oh well- I have enough skill to make a gravy that will turn out but you may want to edit for clarity- thanks! My kitchen smells good already having finished browning my chops! And thanks for the proofread. It must have been that way for over 2 years and this is a popular recipe. I did a fast edit just now to fix that. But this recipe looks like it needs a rewrite. I will do that in the next few days. For those who think these pork chops are too thick treat them like a steak. I don’t like thin steak either. I like good tender moist meat not shoe leather. First, sorry for the delayed reply. When I go thick, I try to skip the meal before or talk my wife into splitting the meat. But truely, in a recipe like this, the center of the meat is the star. Gave this a try, turned out really well. I paired it with some oven roasted red potatoes/onions. After letting the potatoes bake for about 30 min. Seared the chops and then laid them on top of the potatoes to finish roasting in oven. I tried this recipe. I followed it as instructed. It was definitely very good. Is give it a 4 only because I felt that the brine wasn’t quite salty enough. However it did make the chops moist and juicy. There is a range of salt that is recommended for a brine so you could up it a little but I would suggest just adding a little during cooking since it was moist. These are the absolute best pork chops I’ve ever eaten! Thanks for the recipe. I do love a good pork chop. 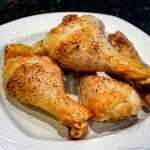 I made these chops this evening and they turned out great, so moist and delicious! I didn’t brine since I never manage to plan ahead that far. I pretty much followed the recipe as written and I made the gravy too, I’m so impressed with myself, LOL. I’ve made a few of your recipes and they always turn out delicious. 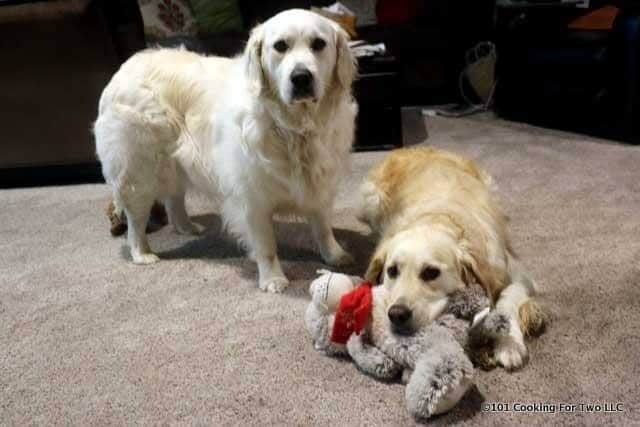 And I love your dogs, they are gorgeous. 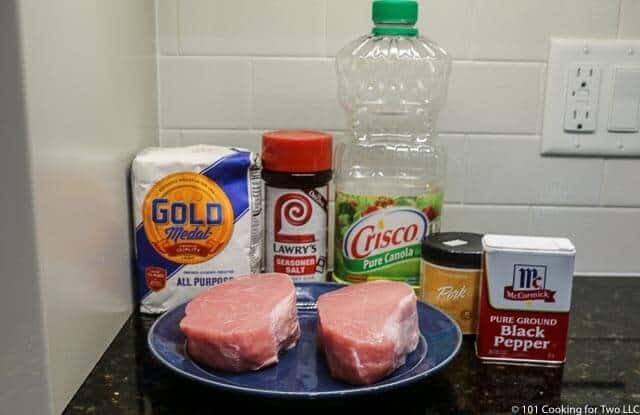 I make pork chops a lot and this recipe was one of my favorite! I used bone-in center-cut one inch chops. They only took about 10 minutes to cook in the oven after I browned them on the stove. I took them out at 148° and let them rest for 10 minutes. Thanks for the great recipe. I do a lot of pork chops also. 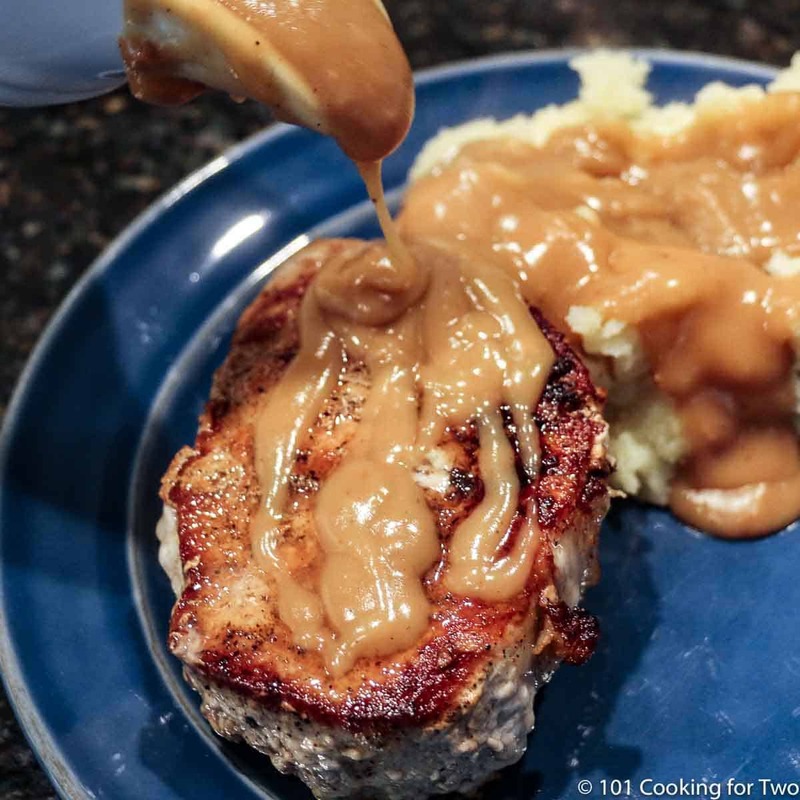 If you are at one inch thick you could also do stove top only https://www.101cookingfortwo.com/30-minute-fried-pork-chops-with-gravy/ . But either work at 1 inch. Yummy! I’m doing this today with Caramelized Onion and Bacon Spaetzle, Honey and Brown Butter Nut Squash, and German Potato Salad. But I’ll be using a brown gravy for the Chops and Noodles. I generally do not like pork chops but I had these amazing 1 3/4 inch thick chops and tried this recipe. They were not only tender but the addition of the gravy was excellent. I did brine the chops. Will definitely use this recipe again. I do like to do a brine in a lean pork like this is possible. It seems to help if you have the time. And pork gravy is heavenly. and this one looks like a winner; Gonna try it this week. Had my first pan seared/oven roasted Shell last night & it was superb! Looking forward to trying more of your favorites. Welcome to the site. 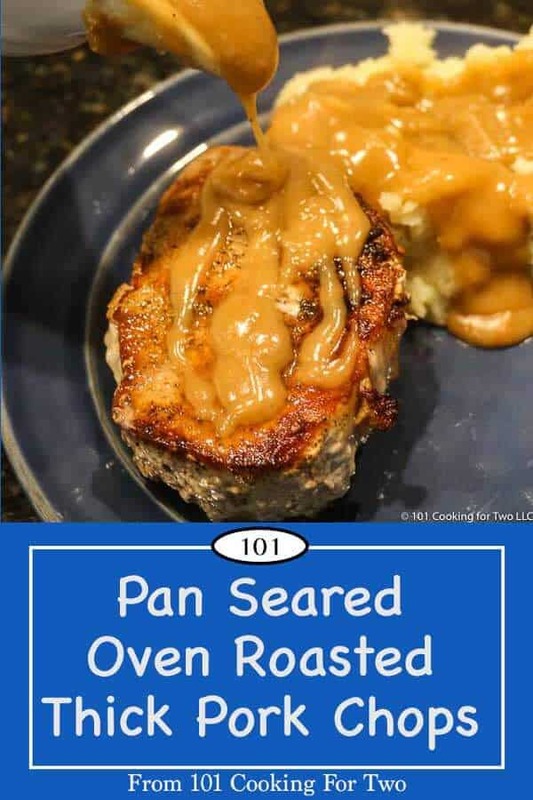 I really like this recipe but my favorite pork chop with gravy recipe is https://www.101cookingfortwo.com/30-minute-fried-pork-chops-with-gravy/. It is so easy and my wife is in love with it. 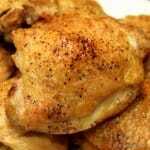 A most excellent recipe, especially for a novice looking to improve their game in the kitchen. Step-by-step, and photos were spot on. Caution, watch how hot the oil gets. I did not quite understand the ‘shimmer’ comment. I cheated on the gravy and used the jar stuff from store (Heinz), added to the skillet to get all the good stuff and flavor into the gravy. Worked out superb. With mashed potatoes, and veggies, the meal was outstanding. I tried the brine for 35 minutes- chops were moist. DEFINATELY recommend the brine step. Minus one star for size of chops- wife and I just could not eat it all. However, made for great microwave meal at work. Very much thanks for your hard work to post this recipe. Now a keeper in our house. You should work on your own gravy. 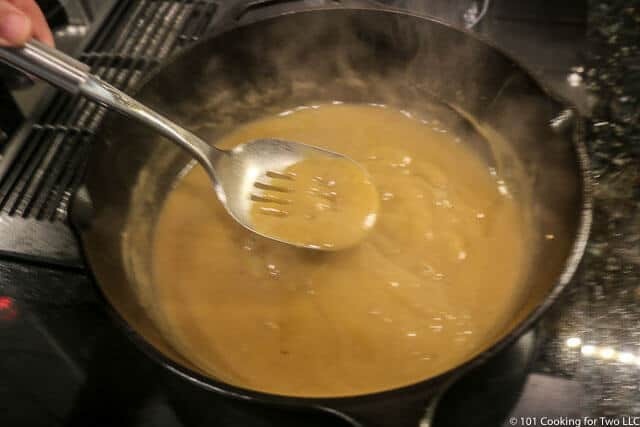 https://www.101cookingfortwo.com/how-to-make-gravy-101/ You will like it better and it really is simple. I agree… just a little too much meat for me and the brine is a good idea especially with a thicker cut.